are available on this site in CD and Download format! Little Warrior and Caravan are also available at iTunes! and CD Baby! Engelken displays her take-no-prisoners, full-of-risks attitude, playing with the versatility and different colors of her voice, mysterious, mischievous, adventurous, intimate and sensual. For up-to-date news, visit FACEBOOK and Twitter! Blessed with superlative power, control and range. Engelken can, as mood requires, be as soft as dew or as intense as a sleet storm; her interpretive instincts are astounding. GIVE THE GIFT OF FRESH MUSIC! Create your own Lisa Engelken Radio Station on Pandora.com. Lisa Engelken Radio Station! Tune in to XM/SIRIUS JAZZ CHANNEL to hear tracks from both CARAVAN and LITTLE WARRIOR! Lisa Engelken is a passionate and fearless vocalist. A writer, producer and arranger who keeps her listeners on their toes. Her sonic palate colors cacophonous then suddenly strips down naked. Consonance and dissonance interweave, swirl and wrestle for position while her voice cuts raw, soars in sheer power, or floats pristine. Little Warrior named to Top 10 Albums of the Year! 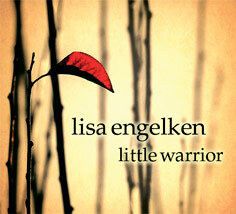 About Little Warrior: Lisa Engelken arranged & produced the eleven arresting tracks on Little Warrior, that soar up to the heavens and careen back down to the depths, as she paints a true chiaroscuro of her anima. Little Warrior was named to the Top 10 Best Jazz Albums of the year and among the Best of 2013 by the Jazz Journalists Association. Engelken knows how to push all the right hipster buttons and deliver a winning performance in the process. This crazy kaleidoscope of a journey invites you to surrender control and let her be your tour guide through the world she has created. Engelken never imitates, and adds her own unique and fresh arrangements, making Little Warrior another gem in her ever growing and sparkling catalogue. Lisa’s “White Wedding” is the Song of the Day Enjoy the video! 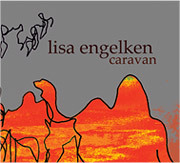 CARAVAN (released in 2010) features 10 of Lisa’s fresh arrangements of standards, Brazilian, and contemporary selections by such varied composers as Tizol & Ellington, Joni Mitchell, Baden Powell, Cole Porter and Billy Idol. In addition, Caravan includes “From the Earth,” a new lyric version of Freddie Hubbard’s jazz-funk classic Red Clay. Mr. Hubbard recorded the landmark Red Clay album 40 years ago, and Lisa was inspired to revisit its title track. She is grateful to have received Mr. Hubbard’s personal review and permission to release “From the Earth” – one of the last works approved by the late-great trumpeter himself. Bold, lush, exotic, and just a little bit dangerous, like waves of sound and heat: Evel Knievel and Janis Joplin. Like Evel, she is a fearless daredevil, but never reckless, knowing exactly whether her voice can jump through a ring of fire and over 30 elephants– or whether it can go for 31. And like Janis, she gives every ounce of herself onstage. 2016- Lisa took the entire year off. She continued to coach vocal students, wrote a couple of new tunes in spite of herself. She has enjoyed the time off immensely! 2015 has been a very productive year for Lisa: the Midwest Debut of Little Warrior in Denver and Kansas City; her work as a recording & mixing engineer with seven different musical acts; earning her ProTools 11 certification. Highlight concert appearances included the SF Beat Museum’s raucous sold-out Jazz & Poetry event at Top of the Mark in San Francisco and KCSM Jazz FM’s “In the Moment Summer Concert Series” for live broadcast of her RUMInations Project in front of a most appreciative audience. Happy new year! 2014: Lisa looks forward to new collaborations at home and abroad. She is currently enrolled in Audio Engineering courses, to acquire even more tools on her road to expression! You can look forward to new LIVE TRACKS that Lisa will start to edit, mix and release here on her site! December 2013: Despite its late arrival, Little Warrior is recognized among the Best of 2013 Jazz Releases by the Jazz Journalists Association! November 2013 hosts sold-out performances of Little Warrior live! With great special guest musicians and poets that grace the stage. October 2013- Caravan is released and in JazzWeeks Top 100 for six consecutive weeks, with national and international airplay! September 2013. Lisa HAS FINISHED Little Warrior! Little Warrior is available October 1, 2013, in stores and on iTunes! Hopefully, we will also get her CD and downloads available on Lisa’s site so you can do something radical and buy directly from Lisa! Lisa’s national radio campaign, headed up by the folks at GROOV Marketing, launches the same day! Little Warrior is being previewed across the nation. Thank you to radio hosts for giving Little Warrior a spin! June 2013. Lisa took her headphones off for a moment and traveled to Denver to play at Dazzle Jazz club on Saturday, June 29th, 2013. Eric Gunnison (pno), Zack Teran (bs) and Matt Swindells (drms) joined Lisa for two sold-out performances at the club. While in Denver, Lisa stopped by KUVO FM jazz radio for a visit with Arturo Gomez. It was an exciting interview where Arturo previewed two preliminary mixes of tracks from “Little Warrior”- Viva la felicita’ and Throw It Away. RECORDING of “LITTLE WARRIOR” is finished! Lisa is now at work editing the last 3 tracks to send on to the engineer to mix! “Little Warrior” features brilliant performances by Bill Cantos, piano; Sam Bevan, bass; and Matthew Swindells on drums. Among the special guest artists appearing on “Little Warrior” are Matt Heulitt (electric guitar), Carlos Oliveira (acoustic guitar), Rob Reich (accordion); Evan Francis (flute), Joel Behrman (trumpet/trombone), Erik Jekabson (flugelhorn), Mike Olmos (trumpet), Robert Roth (tenor sax), Brian Rice (percussion), and the backing vocals of Jennifer Lee, Christie Winn and Carey Williams. Sold out with great sound at The Sound Room in Oakland, CA! Lisa kicked off her indiegogo campaign to finish “Little Warrior” with a sellout show at the premiere jazz gallery, The Sound Room. The show was particularly special as Lisa reunited pianist Frank Martin (Sting, Elton John, Airto Moreira & Flora Purim, Eyedentity, and on and on), and was joined by her favorite sidemen bassist Sam Bevan and drummer Matt Swindells. The Quartet played selections from the new album and debuted a new arrangement of an Elvis Costello tune that Lisa hadarranged especially for the concert. It’s hot out there! Lisa took her songs on the road to Denver’s premiere jazz club Dazzle Jazz on Saturday, June 16th. The shows were sold-out and featured renowned Denver musicians Eric Gunnison on piano; Eduardo “Bijoux” Barbosa on bass; John Lake on trumpet. In Kansas City at the Blue Room on June 22nd, Lisa and her quintet, made up of San Francisco drummer Matt Swindells and Kansas City sidemen Roger Wilder (pno), Gerald Spaits (bass), and Stan Kessler (trpt). Lisa said she’d stay put, but ended up in Los Angeles for a few fine days in September, writing and recording two new tracks with engineer/composer Steve McCormick, producer Sandra Bishop and multi-instrumentalist Peter Fox. The fab four collaborated and created in real time. “Tuesday Blues,” part West-Coast jazz -part Angelo Badalamenti (David Lynch) and “Your Dreams,” described by Bishop as “Radio Head meets Johnny Cash.” The track “Your Dreams” will be included in the “Moonlight Project,” conceived by author and photojournalist Seanie Blue and the aforementioned cohorts. Stay tuned for more! Lisa continues to write and and arrange new works for her new album “Anima Explorations.” It’s the home stretch, folks: finalizing arrangements and compiling the tunes that will make it into the studio. Like Santa Clause, she i making the list and checking it twice. Jardine’s Joint was jumping in Kansas City on Friday night, June 24th– a packed house delighted in seeing Lisa perform with Roger Wilder, pno; Gerald Spaits, bass; Matt Swindells, drums; and Stan Kessler, trmpt. The week before, Lisa’s show at Dazzle Jazz in Denver was off the hook– Saturday, 6/18- two shows with a stellar band that included SF drummer Matt Swindells and Denver’s finest: Al Hood, trumpet; Steve Denny, piano; and Ken Walker, bass. 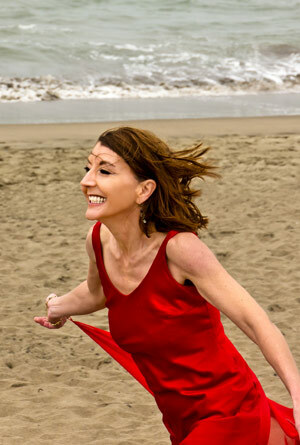 Lisa just performed two exhilarating concerts debuting new music from her “Anima Exploration” project at ArtSpace 4500 (SF) and at the Jazzschool in Berkeley. The shows featured Lisa’s originals and new arrangements of tunes by such artists as George Harrison, Wayne Shorter, Abbey Lincoln & the Cars. San Jose Jazz presented Lisa in April as part of the Wednesday Night Concert Series at the Fairmont. The jazz audience was warm and responsive and once again proved why San Jose is one of Lisa’s favorite cities to play. Read more from Andrew Gilbert, San Jose Mercury News! In March, Lisa opened the 2011 concert season with the debut of her originals and arrangements. The house was literally packed- a warm audience filled with open hearts and minds: another truly magical event at the Red Poppy Art House! Lisa is currently writing & developing new material for performance in 2011 entitled “Anima Explorations,” with plans to record in Fall 2011. In February, Lisa traveled to Washington, DC to do an impromptu show and to edit concert footage of her two East Coast concert events last November in DC and New York City. Special thanks to The Deej in Washington DC for a fabulous sold-out show at the Underground Theatre. Never was there such a screaming, dancing, enthusiastic crowd in attendance at a jazz event! And, thank you, Faunee WPFW Radio Host (89.3 FM, Washington, DC), for blessing the magical event with her powerful vibe and presence. Lisa would like to thank Sandra Bishop, Seanie Blue, Riccardo and Matt Neufeld for the brilliant video and photography that they shot. THANK YOU: SFJAZZ Organization for presenting Lisa’s powerhouse performance at SummerFest 2010 in Levi’ Plaza, San Francisco in October (A sultry photo by Caitlin Burke really captures the steam & vibe of the daytime concert.). And….happy 2011 new year with gratitude to all of you who attended the sold-out concert events at ARTspace 4500 and Red Poppy Art House (SF), Denver’s Dazzle Jazz and the Jazzschool in Berkeley and the raucous performance that closed the 2010 Fillmore Jazz Festival! Caravan, the title cut, is indeed a revamp of the harmonies and arrangements of Debussy and the British alt-pop band Radiohead. Only Lisa E. could conspire to combine those two influences so effectively. Add singer, composer and producer Lisa Engelken to that pantheon of great jazz artists. Caravan will stand the test of time and is a harbinger of more great music to come. Directly support Lisa’s work by ordering Caravan here! Create your own Lisa Engelken Radio Station! CARAVAN is available for download at iTunes & cdbaby.com. Caravan is also available in-store at Groove Yard Records, 5555 claremont avenue, oakland, ca. CONCERT REVIEW: CD Release Event in Denver, CO: “…It’s not easy to stand out as a female jazz singer: singers are nearly as ubiquitous as Harleys at Sturgis. It takes a little something to stand out from the crowd. Like at Sturgis, bigger and louder won’t necessarily do the trick. It might take a little finesse, a little nuance, maybe a bit of panache. If you add all that together and mix in some genuine creativity, you may have found Lisa Engelken. “Engelken veered across a wide emotional spectrum so broad it could serve as a case study for manic depression. From joy to sadness to nonchalance and numerous points in between, Engelken bared her soul on stage. She put it on the line in the context of jazz standards that she arranged for herself. For radio appearances and archived interviews: PRESS.